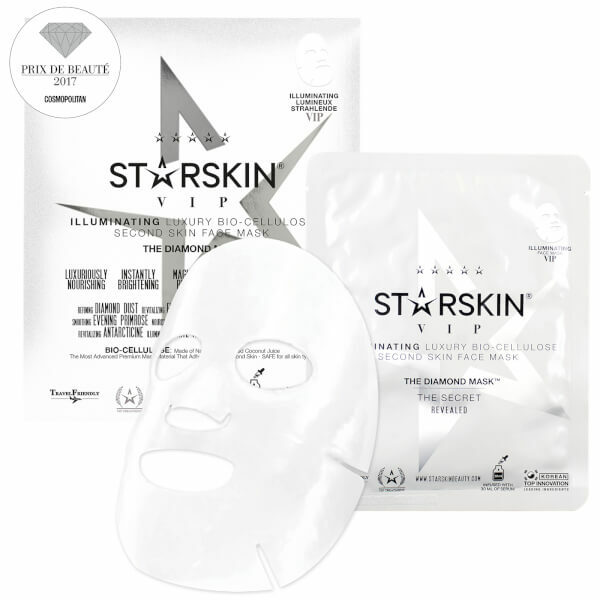 Energise the complexion with the STARSKIN The Diamond Mask™ VIP Illuminating Coconut Bio-Cellulose Second Skin Face Mask; an elite sheet mask that fits closely to the contours of the face and brightens the visage. Instantly transforming skin, the premium face mask is created from naturally fermented Coconut Water and is soaked in a rich and creamy serum, which is formulated using the finest botanicals and precious gemstone extracts. The bio-cellulose mask boasts a base of Evening Primrose extract, which softens the complexion and ensures skin is smooth, whilst ultra-fine Diamond Dust lends an illuminated appearance. Emerald and Tourmaline extracts work in synergy to re-energise the face and anti-oxidant rich White Mulberry Bark offers a flawless finish. Working continuously for fifteen to twenty minutes, the VIP mask reveals a crystal-clear complexion that is visibly bright and perfected. Oenothera Biennis Flower Extract (Evening Primrose), Butylene Glycol, Glycerin, Niacinamide, Ethylhexyl Isononanoate, Persea Gratissima Oil, Portulaca Oleracea Extract, Cocos Nucifera Fruit Extract, Morus Alba Bark Extract, Pinus Densiflora Leaf Extract, Vaccinium Angustifolium Fruit Extract, 1,2-Hexanediol, Achillea Millefolium Extract, Arnica Montana Flower Extract, Artemisia Absinthium Extract, Chamomilla Recutita Flower Extract, Gentiana Lutea Root Extract, Water (Aqua), Betaine, Olea Europaea Fruit Oil, Rosa Canina Fruit Oil, Rosa Damascena Flower Water, Hydroxyethyl Acrylate/Sodium Acryloyldimethyl Taurate Copolymer, Pseudoalteromonas Ferment Extract, Adenosine, Hydrolyzed Wheat Protein, Emerald, Hydrolyzed Soy Protein, Tocopheryl Acetate, Diamond Powder, Polysorbate 60, Sorbitan Isostearate, Tourmaline, Pelargonium Graveolens Flower Oil, Simmondsia Chinensis Seed Extract, Citronellol, Geraniol, Rosa Damascena Flower Oil, Citric Acid, Potassium Sorbate, Sodium Benzoate, Tripeptide-10 Citrulline, Tripeptide-1.